As you know, I’m quite the social butterfly. I get invited to a lot of functions and parties and I also frequently entertain at my own casa. More often than not, these get-togethers focus around food, whether it be breakfast, lunch or dinner and are usually that of the potluck variety. There is a monthly breakfast potluck I attend at a friend’s home on the lake and while I first started off by bringing a variety of different baked items, I realized the one thing I made that always got the most attention and praise was my granola. Ahh yes, leave it to the Oregonians for loving them some granola. The same folks who drive Subaru Outbacks and wear socks with their Birkenstocks. Anyone who says that’s just a stereotype of people in Oregon and not true, is just plain wrong. Not there’s anything inherently bad about wearing socks with their sandals (ahem, mi abuelo), but it doesn’t necessarily look good with tight biking shorts. But anyway, back to my much-loved granola. So I figured if it was granola that they requested at the monthly breakfast potluck, it was granola that they would get from that point on. 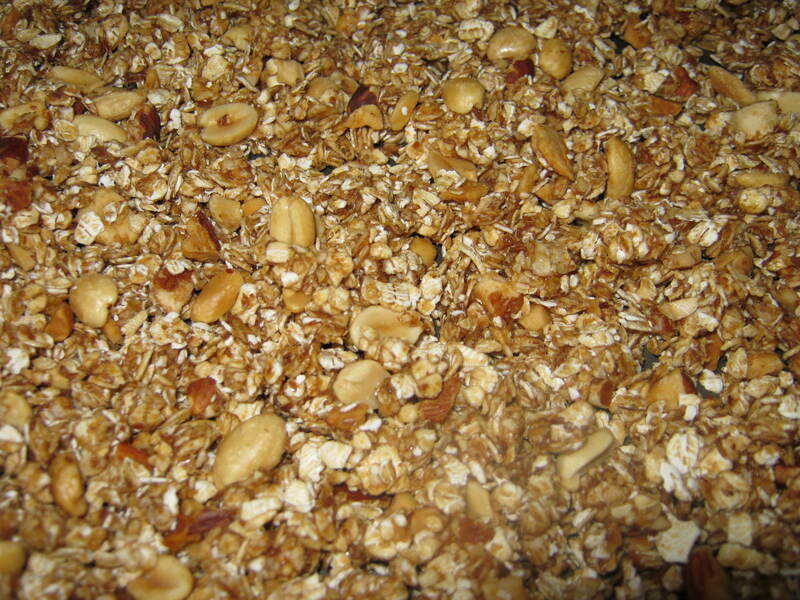 The beauty of the granola, other than the taste of course, is the vast number of combinations you can come up with. My granolas pretty much turn out different each time I make them, usually based upon what’s occupying my pantry at that point in time. For my most recent concoction, I was once again drawn to mi mama’s large peanut butter surplus and was inspired to create a granola with that as the main focus. It took awhile convincing her to unlock one of her jars from the mighty nut butter vault, but in the end, I managed to get my paws on one of her containers of crack peanut butter. 1) Preheat oven to 300 degrees. 2) Heat all wet ingredients, peanut butter through vanilla, in a small saucepan until smooth and creamy ~5 minutes. 3) In a large bowl, combine all dry ingredients. 4) Pour wet ingredients over dry and mix until thoroughly incorporated. 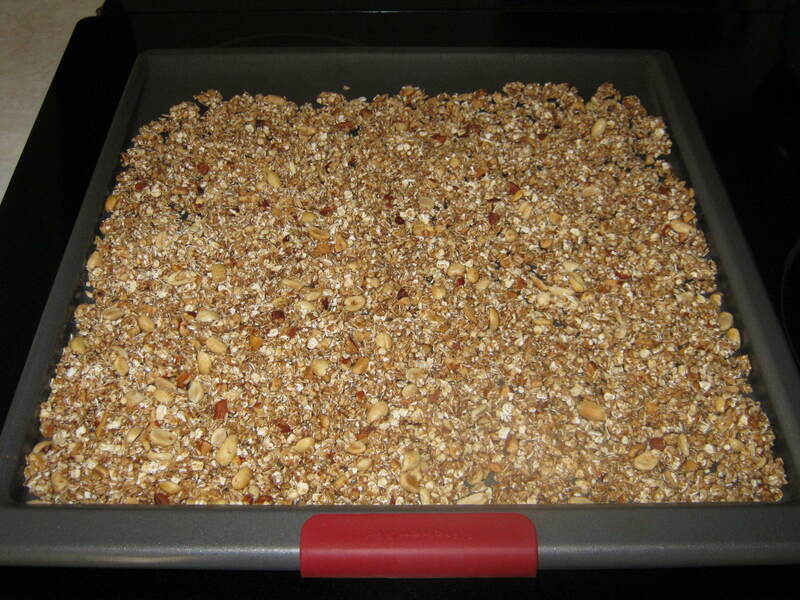 5) Spread granola into a thin layer on a baking sheet. Bake 30 minutes, stirring occasionally to avoid burning. 6) Remove from oven and allow to cool completely before transferring to a container (or straight into your mouth). So simple and easy, and yet so delicious. You can use the granola as a topping for a yogurt parfait, add it to your morning bowl of cereal or just eat it plain with a handful of raisins. Mmmmmmm!!! 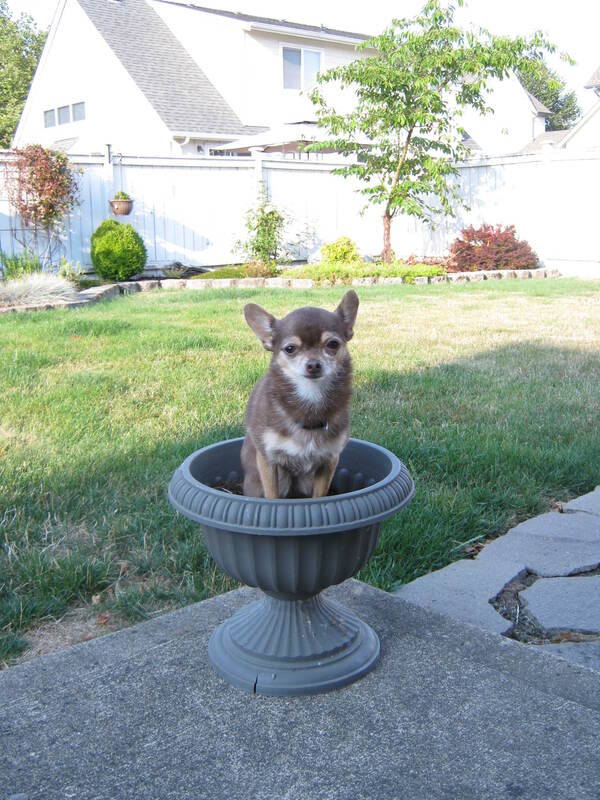 Now if you’ll excuse me, I need to go “fertilize” mi mama’s potted plant. I hear it’s perfect for gardening. I want a potted plant just like that one! BTW, I love your granola!